The highway use tax applies to highway heavy motor vehicles with a taxable gross weight of 55,000 pounds or more, termed as Taxable Heavy Vehicles. The weight limit generally includes large trucks, truck tractors and buses. The tax is based on the weight of the vehicle and a variety of special rules apply. These special rules are explained in the instructions to Form 2290. Taxpayers may now pay the heavy highway vehicle use tax with a debit card or credit card. Payment can be made over the internet, phone or mobile device. Also EFW – Direct Debit and EFTPS are available for them to choose from. Some taxpayers have the option of filing Form 2290 on paper. However, taxpayers with 25 or more taxed vehicles must e-file Form 2290. Vehicle owners must file returns and make tax payments by August 31, 2018, for vehicles used on the road during July. All owners should consider filing and paying electronically. They don’t need to visit an IRS office because owners can file the form and pay any required tax. IRS.gov has a list of approved e-file providers for Form 2290 on the 2290 e-file partner’s page. Generally, e-filers receive their IRS-stamped Schedule 1 electronically minutes after filing. They can then print the Schedule 1 and provide it to their state department of motor vehicles, without visiting an IRS office. For those who want face-to-face service, all IRS Taxpayer Assistance Centers now operate by appointment and taxpayers can call 844-545-5640 to schedule one. For more information about the highway use tax, vehicle owners can visit the Trucking Tax Center at IRS.gov/truckers. 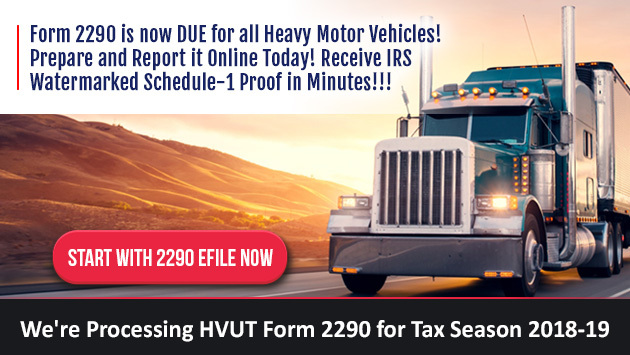 Electronic filing is the Fastest way of getting 2290 Truck Tax Returns reported with the IRS. Online filing is simple, easy and quick at TaxExcise.com, an IRS approved e-File provider for Form 2290 since 2007. The first website authorized by the IRS, most experienced in handling 2290 efiling. Millions of trucks has been reported with TaxExcise.com and top rated website.